The Box is pleased to present the first US exhibition of European artists Pierre Guyotat and Christoph von Weyhe. Titled Scenes and Stages, it will present two distinct bodies of work by each artist which both engage in experiences of time and theatricality. Pierre Guyotat (born 1940, Bourg-Argental, France) is one of today’s most subversive authors. For over fifty years, since the original French publication of Tomb for 500,000 Soldiers (1967), and Eden, Eden, Eden (1970, immediately censored), he has been bringing revolution into poetry, altering the very structures of language and of culture. His visions of war and sexual exploitation, as well as his account of the cosmological nature of existence, have given many artists new ways to find their own voice. His more recent books, Coma (French edition 2006, American translation with Semiotext(e), 2010) and In the Deep (French edition 2010, American translation with Semiotext(e), 2014), have presented readers with the existential risks Guyotat himself took to make radical art. In the Deep evokes the hesitations of the young Guyotat, who was torn between becoming a painter or a poet. Christoph von Weyhe (born 1937, Halle/Saale, Germany) has been painting the port of Hamburg for over forty years. This port was the last sight von Weyhe, then in his 20s, would see as he left Hamburg on a night train to Paris, a city where he would train to become an artist and where his continues to live and work. At age forty, when he returned to the port, he was inspired to capture its image on paper with gouache. Executing these works on site before returning to his studio in Paris to create the large-scale paintings, this process requires months of work to complete each painting. Von Weyhe has been working in this way, and addressing this same port, for over 40 years. Both artists address issues of theatricality, in ways that are consciously anti-theatrical. Guyotat’s drawings feature bawdy fragments from the extraordinary world he has created. They provide humorous and subtle figurations of what he calls “scenes”, where humans, semi-humans and animals are offered to viewers as a provocation to question their own humanity. Von Weyhe’s paintings are entries into the overwhelming experience of the painter being confronted by what to him is the world’s greatest stage: the harbor, an ever-changing place of labor. He participates in this very labor by dedicating dozens of hours to every painting, layer after layer. Both bodies of work, albeit formally extremely different, set an example for uncompromising art of extreme rigor and energy. Over their sixty year-oeuvre, Pierre Guyotat and Christoph von Weyhe have experimented new ways to make art: discovering the consistent series started forty years ago by Weyhe and the new drawings of Guyotat invites us to question what art is, what it can be, and what is our position as human beings. The largest exhibitions devoted to Pierre Guyotat and Christoph von Weyhe’s work were organized by the late couturier Azzedine Alaïa at his not-for-profit exhibition space, the Galerie, both in 2016. Azzedine Alaïa’s advisor Donatien Grau, with whom this exhibition is conceived, curated both. The exhibition devoted to Pierre Guyotat brought together his manuscripts in conversation with works by artists who admire him - Miquel Barceló, Juliette Blightman, Daniel Buren, Elijah Burgher, Michael Dean, Cerith Wyn Evans, Paul McCarthy, Jean-Luc Moulène, Klaus Rinke and Christoph von Weyhe. Guyotat has exhibited at Cabinet, London, 2017; Yvon Lambert, Paris, espace diaphanes, Berlin, and Villa Medici, Rome, 2018. Pierre Guyotat’s archive is held at the Bibliothèque Nationale de France, France’s public library. 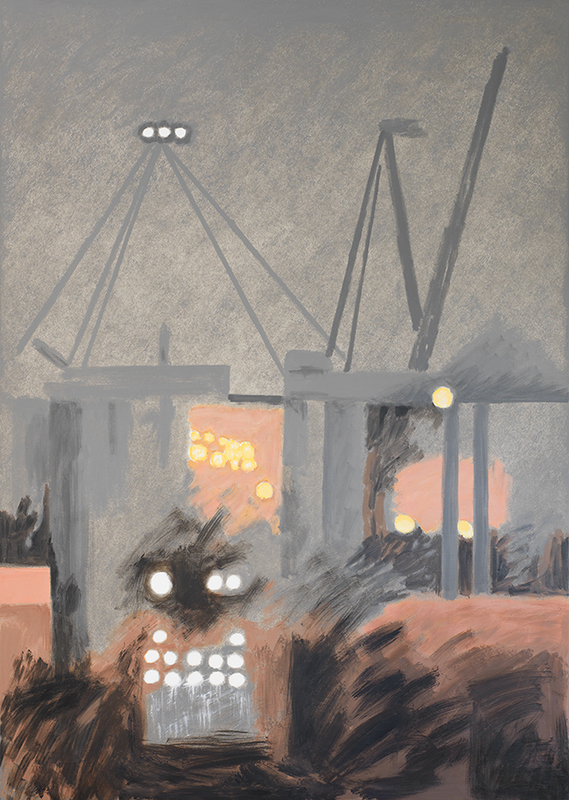 Christoph von Weyhe’s exhibition presented forty previously unseen large-scale gouaches. His paintings are held in such prestigious collections as the Musée d’Art Moderne de la Ville de Paris, Paris; the Städel Museum, Frankfurt-am-Main; the Brant Foundation, Greenwich. For press or general inquiries email info@theboxla.com.